E. Todd Schroeder, Ph.D., associate professor at USC is one of those guys. 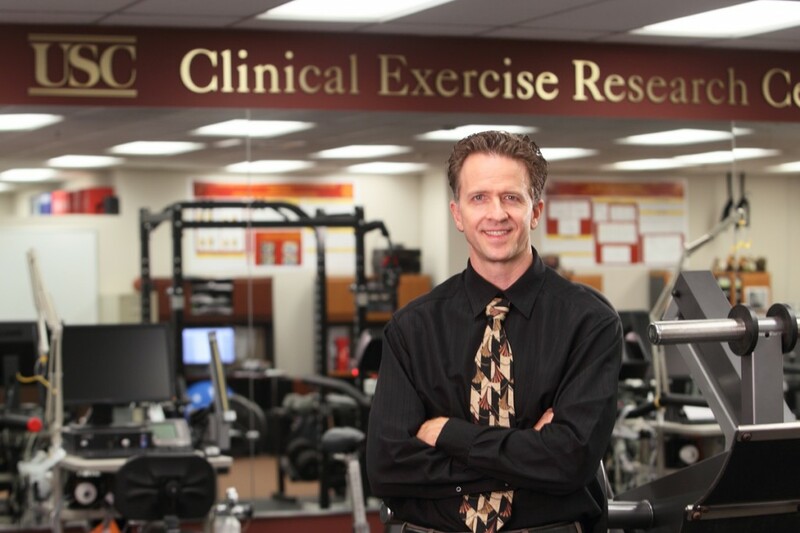 Dr. Schroeder heads much of USC’s research on muscle and exercise physiology, and one of his specialties is the effects that resistance training has on the almighty testosterone. I sat down with Dr. Schroeder to discuss the connection between exercise and testosterone. Enjoy! CW: Dr. Schroeder, thanks for talking with me today. First off, can resistance training increase testosterone levels? Dr. Schroeder: Yes, Chad, it certainly can. If the intensity and load are high enough, you can significantly increase testosterone above baseline levels. CW: Explain the time frame we’re talking about here. Does the testosterone increase occur immediately, and how long does it stay elevated? 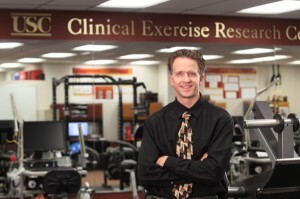 Dr. Schroeder: Up to 30 minutes post-exercise is where we see the peak in testosterone. By the 45-60 minute mark the elevated level returns to baseline. CW: What type of training parameters have you found to have the most significant effect for increasing testosterone? Dr. Schroeder: Generally speaking, 6 sets of 7-8 reps with the heaviest load a person can handle with compound exercises works well. Importantly, the rest periods must be relatively short, somewhere around 45-60 seconds between straight sets. CW: That sounds pretty intense! Dr. Schroeder: It is. You see, it’s the stress we create in the lab with resistance training protocols that induce the anabolic response. Testosterone, cytokines and other mediators all play a role to create that effect. CW: You mentioned that testosterone peaks around 30 minutes post-exercise and then returns to baseline 15-30 minutes later. Is that enough time to trigger an anabolic response that will significantly improve muscle mass? Dr. Schroeder: Probably not. At this point it’s difficult to say what effect, if any, that temporary boost in testosterone will have, but it certainly won’t hurt your efforts. CW: That makes sense. After all, many guys out there consistently train with plenty of intensity, but they still struggle to pack on new muscle. Can you talk a little more about what role you’ve seen testosterone play in the lab? Dr. Schroeder: We’ve been studying the effects of resistance exercise and testosterone on the aging process. Testosterone is helpful in tissue repair and it decreases inflammation. Therefore, older individuals could benefit from protocols that keep it as high as physiologically possible. CW: Is there anything you found during your research that surprised you? Dr. Schroeder: Yes, a few years ago we compared the testosterone levels of male DPT students with master’s level male athletes in their 50s. We were surprised to find that the male DPT students with an average age of 24 years had lower testosterone than those older men. CW: Wow, that just goes to show what negative effects the stress of graduate school can have on your T levels! I can relate considering I’m going through the program now. Indeed, whenever a guy asks me how he can naturally boost his testosterone, I tell him to start meditating 10-15 minutes per day. Dr. Schroeder: I think that’s good advice and it might help. With regard to the relationship between testosterone and exercise, I recommend your readers check out the debate paper I contributed to for the Medicine and Science in Sports and Exercise journal. You can find that paper here. So where do Dr. Schroeders’ statements leave us? For starters, it’s clear that the scientific world still doesn’t understand, or hasn’t discovered, the physiological processes that lead to hypertrophy. It would be easy to single out testosterone as being the main hormone that triggers the cascade of events leading up to muscle growth. However, studies don’t support that notion. Indeed, a study of men with near castration levels of testosterone were able to experience significant gains in size and strength with resistance training (Hanson et al, J Gerontol A Biol Sci Med Sci, 2013). What do we know? The resistance training workout itself is obviously the stimulus for muscle growth, even if the scientific world still hasn’t figured out the physiological processes it triggers. So if you want to build muscle faster, the most logical strategy is to find ways to stimulate your stubborn muscle groups more often. I’ve spent the last 13 years tweaking and experimenting with short High Frequency Training workouts to help you build muscle faster than ever before. Hey Chad, That was an awesome post! Really good info, I’ve been following your work for the past roughly 9 years, I still have a copy of Huge in A Hurry that I look through every once in awhile. Thanks for all the good info friend! I am now certified as a trainer myself and I still like reading your articles! Keep up the good work! Thanks for more great science oriented medium. As a Medic I appreciate the connection between exercise and the human bio-chemistry and physiology. I was inquiring on your findings or opinions on the effect of OVER exercise on the Testosterone levels in men. I know we try and mitigate the negative effects of our purposeful stress on our bodies and minds by adequate nutrition, recovery tools, and proper planning, but is there a point where the T levels are negatively impacted regardless of those variables. How do you then develop plans for against this? CW: I’ll have to ask Dr. Schroeder about overtraining and T levels. I know some coaches purposely overtrain athletes – acutely – and then drastically increase food and decrease volume. Theoretically, it might boost T levels. Long term, though, the key is to manage volume and intensity, get plenty of healthy food and rest to optimize T levels. Regarding BW training, my best source is HFT2 (click the banner at the end of blogs). The explanation of what I do, and why, is beyond the scope of this comments section. I agree that testosterone should not be singled out. Testicular cancer and chemo left me with a very low amount of testosterone and yet I have been able to surprise my oncologist with my muscle mass pretty much each time I walk into his office. For me the only thing that has worked in the last five years since my last chemo session is high frequency training. Chad’s programs have been the basis of my training since his days at T-Nation. CW: That’s great to hear, Marc! You made my day. I’m glad you’re on the road to recovery.